Jake finally lost his first tooth. I say "finally" because every six months for the past year, he's asked the dentist when he was going to lose a tooth. Each time the answer was, "probably within the next six months." 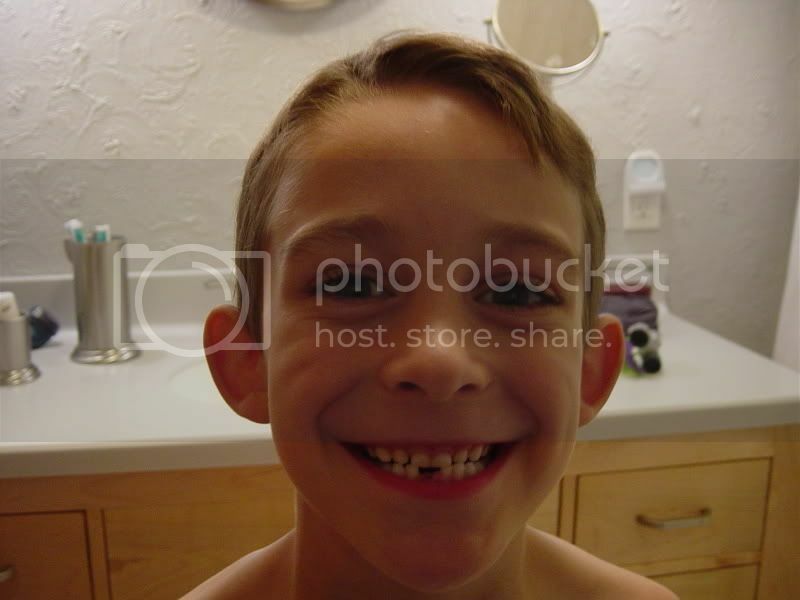 His tooth was loose for nearly two weeks before the darned thing came out. If that were me, I would've had the bugger out on the second day. The tooth was literally hanging by a thread the night before it finally came out, but he wouldn't pull it or let us pull it that night. The next day, he was pushing it back and forth and it finally came out. The good news is that since he waited so long, his new tooth is already poking through. Teeth are going a buck a piece these days. I wouldn't want to be the tooth fairy. Damned inflation!